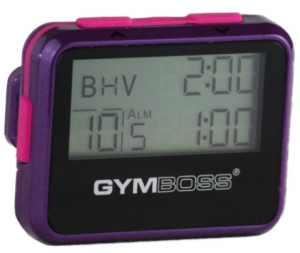 The GymBoss Interval Timer is a must have for all fitness guys or gals! Make your life easier and your workouts more fun and get yourself an interval timer. For years I was doing intervals using the timer on my phone; silly me. Sure it works, technically, but using a GymBoss makes intervals super easy, hands free, and way more fun! For a long time I wanted to add interval training into my workouts. I talked about it, tried it out a little, and debated whether I actually needed an interval timer. Let’s just say that the main reason it took me so long to embrace interval training, was my lack of a proper timer. At first I thought, why would I need one of those? Definitely a waste of money; I can just use the stopwatch on my phone. So I sporadically did interval training, never liking it and keeping it infrequent. But I wanted to change and I realized I needed an interval timer. I researched a lot, read reviews on tons of timers, and the GymBoss was the best. It was exactly what I was looking for! I use the GymBoss interval timer for a variety of workouts, and it allows for almost anything you can come up with. It is my GO-TO for jump rope intervals and wow, what a workout. If you’re just getting into intervals, try setting your timer for 5 reps with one minute on and one minute off. Even with this simple ten minute workout, at the end I’m always sweating and have my heart rate way up. I like to jump rope the first minute, then do jumping jacks for the next minute, and switch off five times. But if you need the rest minute, take it. Once you try out this workout, you’ll see how challenging and rewarding interval training is, and you’ll want to do even more reps.
Another great interval workout is ten reps with two minutes and thirty seconds on and ninety seconds off. I recommend jumping rope first and then either resting for the ninety seconds, or alternating between jumping jacks, squats, and crunches. This workout’s a bit more intense, but only lasts twenty minutes. The GymBoss interval timer easily turns jumping rope into a solid circuit-training workout. I always loved the idea of circuit training, but found that unless I was exercising with a partner, I normally rushed through the workouts. The GymBoss interval timer helped me slow down and make circuit training more approachable. Now I simply set how long I want my reps to be and forget about it. If I want a more cardio-based circuit then I fill my resting rep with another exercise instead. I’ve found that timing myself keeps me on track, plus helps me maximize my time! The GymBoss is awesome for running outside too! It has an arm band to strap it on, so you don’t have to worry about holding it. But the best part about using it is that it keeps you accountable. It’s definitely difficult, when you work out alone, to know if you’re pushing yourself enough, and it’s really easy to say “Hey, I’m going to sprint from this tree past the next five trees and then slow down.” Using the GymBoss takes the worry out. No more questioning if it’s long enough, or if you sprinted enough times. Using the interval timer lets you focus on running, and isn’t that what it’s all about? Let me tell you; it’s hard in the moment, but afterwards you’re going to feel great and super strong! Whenever I travel, the GymBoss interval timer is my go-to travel accessory for fitness. It doesn’t matter where I am going, I always throw my timer and jump rope in my suitcase. This way I make sure that I can get a solid workout in, any time of day or night. Does the hotel have a gym? Doesn’t matter. Does my family have any equipment? Already planned ahead! The interval timer is perfect for visiting family, since regular access to the gym or the ability to run outside, is no guarantee. The Gymboss has SAVED me from getting lazy while I’m traveling! The best thing you can do, whether you’re a workout king or just learning, is add one of these bad boys into your workouts. A GymBoss interval timer is only going to enhance them. Variety is so important to consistent and strong exercise, plus you’ll always have a backup workout in your pocket. If you’re into spinning but can’t get to a class, then as long as you have access to a spin bike you can interval your way through your own workout! It’s awesome if you’re a runner too and looking to speed yourself up. Trust me and get a GymBoss interval timer! It will revolutionize your workouts! Enjoy. The GymBoss Interval Timer is only $20 on Amazon [Get One] A Perfect Holiday Gift! Previous PostPrevious Jump Rope Workout – Get to Jumping!